Obesity is a multifaceted disorder stemming from an imbalance in the homeostasis of energy, which leads to an accumulation of excess energy as fat. It has become of in-creasing concern in the Iraqi population since 2003, when obesity was identified as a significant factor in relation to several diseases. The objective of this study is to inves-tigate the association between oxidative stress and obesity in blood serum of obese Iraqi men. This study was conducted on two different groups with matching age ranges (25-35 years). The obese group consisted of thirty-six obese subjects with varying grades of obesity (BMI 40 ± 5 kg/m2). The control group included thirty-six non-obese subjects (BMI 25 ± 3 kg/m2). 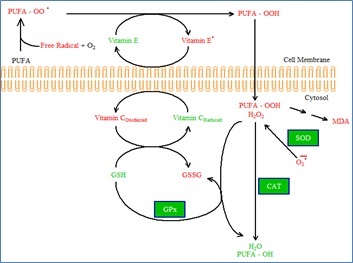 There are two parallel components to this study: The first in-volves Superoxide dismutase activity, catalase activity and total thiol group levels as a marker of antioxidants. The second involves the end product of lipid peroxidation (MDA) as a marker of oxidative stress. When compared with the control group, SOD, CAT activity, and MDA were significantly increased, whereas TTG was significantly decreased. There is a balance between CAT activity compared with SOD activity and polyunsaturated fatty acids hydroxyl peroxide that play a vital role in the regulation of ROS and the body’s defense system in obese men and in the human body in general. Abdulsamie H. Alta'ee et al.